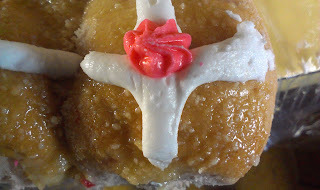 It's Easter season and along with bunnies, fresh cut grass, new outfits and allergies--it's time for HOT CROSS BUNS! "Hot cross buns, / Hot cross buns, / one a' penny, / two a' penny, / hot cross buns / If you have no daughters, / give them to your sons, / one a' penny, / two a' penny, / Hot cross buns"
A hot cross bun is a spiced, sweet yeast bun made with raisins and marked with a cross on the top, traditionally eaten on Good Friday. Growing up in the Catholic church, we always had hot cross buns on Palm Sunday and Easter Sunday too. Sometimes rife with citron and other glaceed candies, they were never hot (which made me cross), but they were always soft and a special treat with the other foods available during hospitality in the basement after church. 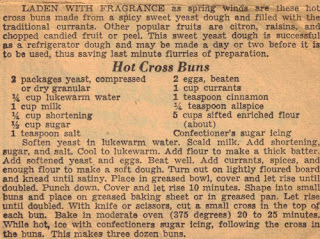 I ran across a recipe clipped from a newspaper or a book that my grandmother stuffed inside The Bread Bible. I don't think she liked the published recipe in that book! 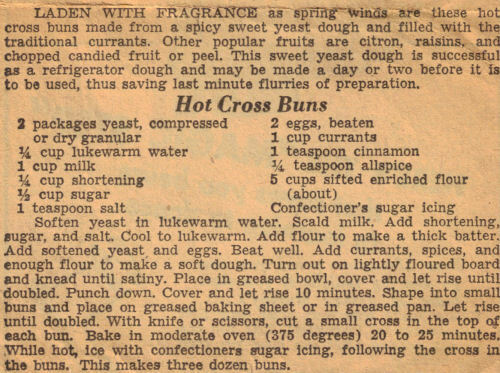 This old recipe is the traditional method of making the buns, complete with making a cross indention on the top of the bun as a placeholder for the icing. In some instances, a cross made of pastry crust is placed on top. My recipe below is a compilation of different recipes gathered over the years and much trial and error in my kitchen (and other kitchens). I actually burned out the heating element in my oven this week making these things. Oh, well. At least the stove still works. Combine 2 cups milk, butter, and 1/2 cup sugar in a large saucepan. Stir and heat until very warm, barely simmering. Turn off the heat and allow to cool until mixture is still warm. Test the milk on your wrist or lower lip. It should, be the same temperature. Sprinkle yeast over mixture and let sit until foamy. Add 4 cups of flour, orange zest, yellow zest, cinnamon (and other spices, if using) and raisins; and stir to combine. Mixture will be very sticky. Cover with a towel and set aside for 2 hours. Next, press down on the dough to gently compress it. Turn dough out onto a floured surface. With floured hands, knead briefly to evenly distribute the raisins in dough. Roll the ball of dough into a log shape and cut it into two halves. Place one half back in the bowl while you work with the other half. Take the dough half you are working with and cut it into 6 equal pieces. Quickly roll it into a ball, then turn the edges under themselves. Place the individual pieces 1 1/2 inches apart from each other on a parchment-lined baking sheet. Lightly spray a piece of plastic wrap with a nonstick cooking spray and cover the dough. Repeat with the remaining dough. Let the dough mounds sit at room temperature (or warm place) to rise again, until the rolls have doubled in size, about 45 minutes. Make an egg wash of one beaten egg with 1 tablespoon milk or water, and brush the tops of the buns with the wash.
Bake for 15-17 minutes or until tops of buns have turned nice and golden brown. Combine the confectioners sugar and milk and mix until smooth. Place the glaze in a paper cone or a small plastic bag. Cut the end of the cone or bag and pipe a 'cross' on the top of each bun. Thanks for the recipe Nikki! BTW, I have "The Bread Bible," and love it. My fav recipes are the cracked wheat bread and the pita. There's several more I want to make from there and haven't gotten around to yet. So upset I didn't get to make Hot Cross Buns this year. I saw you on the Good Morning Show and decided to check out your blog. Can't wait to see what you cook next! When I first got "The Bread Bible", it sat on the kitchen counter untouched. Every now and again, I'll peer at it, but the pita bread is one of my favorites, too.